The future of this area revolves around nature and eco-tourism. No one here wants careless development to damage a nearly pristine environment. Right now a number of local men are trying to make a transition from subsistence fishermen to nature guides; they have formed a cooperative and are working hard to provide high quality tours. But it will take the support of visitors for them to be successful. Nature tours here are not slick— some of the guides have limited English, their boats are safe but very basic– but they grew up in nature and they have a deep indigenious knowledge. You will see amazing things. One word of caution. Organized whale watching is new here and whales are skittish animals. There are specific protocols for approaching them; too fast or too close will frighten them not just for your trip but for others. Some guides are too enthusicastic and want to give visitors the most dramatic views but end up spooking the whales. 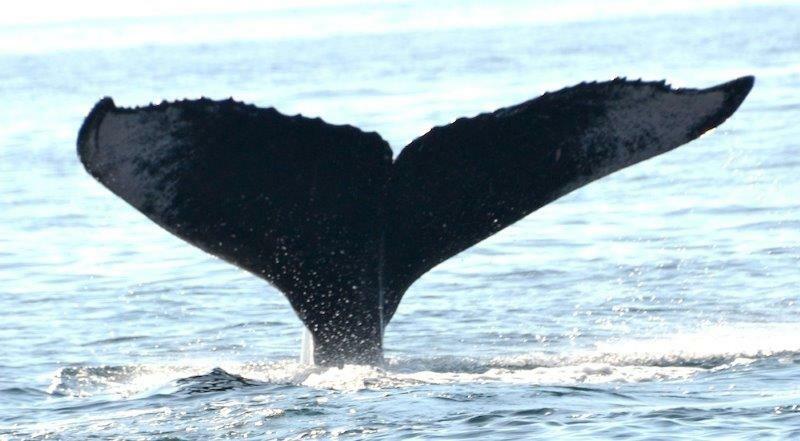 You should tell your guide in advance that you do not want to get too close or to frighten the whales. You have to spend time in the lagoon. 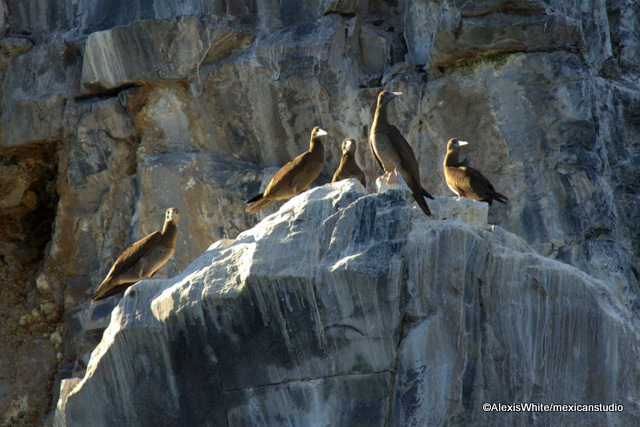 It is the largest in the region and is home to thousands of birds. The best time to go is at sunrise or sunset. It is magical. You can take a tour in a motorized panga or you can kayak on your own. Guides and kayak rental outfits are listed below. 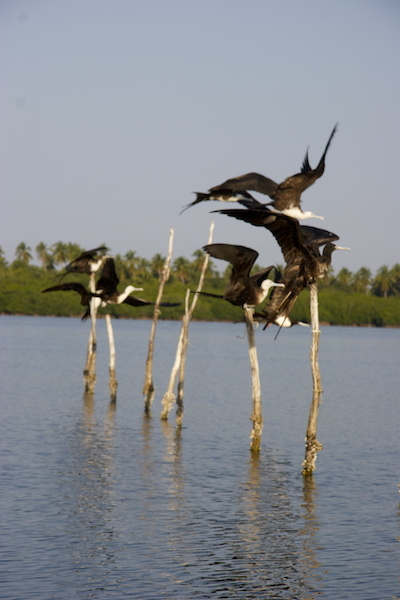 The lagoon is ringed by mangroves and you can approach to within a few yards of pelicans, frigates, egrets and others. The famous roseat spoonbill visits in the remote parts. 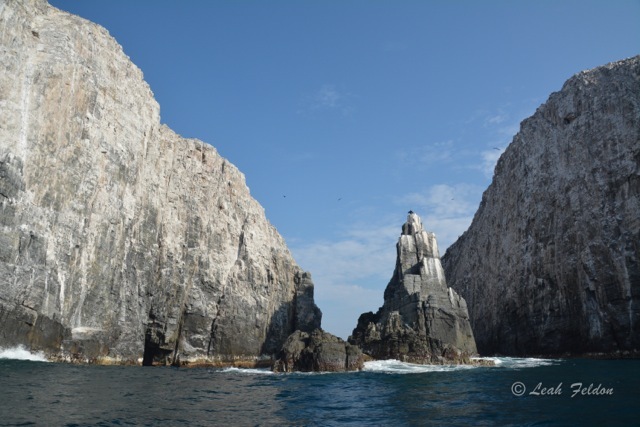 The second must-do tour is a panga ride to Los Moros, the iconic white rock formation about three miles off shore. It is a rookery for thousands of pelagic sea birds; boobies, frigates and the hard to see red billed tropic bird. Along the way, you are likely to see sea turtles, maybe whales, dolphins, bat rays and schooling fish. The scenery is fantastic. Again the local guides operating near the enramadas can take you. You can just walk down to the mouth of the lagoon and book a tour on the spot, or you can use the contact information below to make a reservation. If you like to get up close and personal with nature, you can take a tour to La Manzanillo, a small coral reef at the north end of the bay and snorkel with tropical fish in a protected area. Arturo who is listed among the guides below has started a horseback tour along the edge of the mangroves, through coco plantations to Turtle beach, an endless primordial beach to the south. It is rich in birds and nature. Last Best Beach is a major destination for birders. If you are a serious birder, definitely check the Birding page on this site. Even if you are just casually interested in what you see flying around, you probably will want to get a copy of the foldout guide to birds in the area. Copies are available at the B&B Hacienda de la Rusa in the village and at the enramada La Condesa. 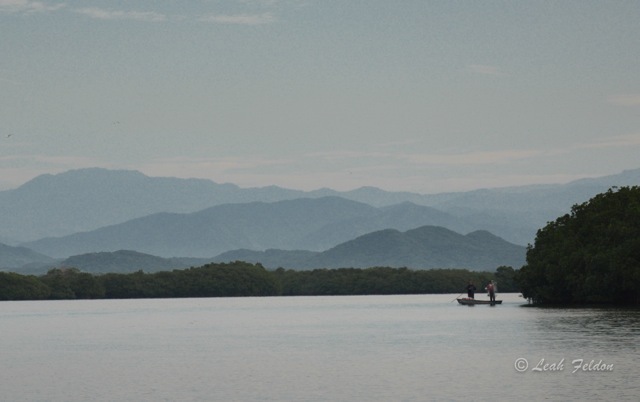 The lagoon and Los Moros tours outlined above will take you to see many of the local species. Laguna Potosi alone hosts over 100 bird species including the prized roseate spoonbill. 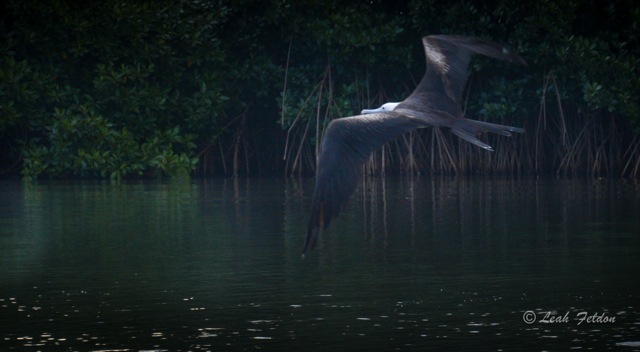 An early morning kayak paddle into the mangroves is simply magical. A boat ride to Los Moros will yield boobies, pelicans, frigate birds and red-billed tropic birds. Humpback whales breed and give birth off-shore during the winter months and it is very common to see them blowing and breaching from the beach. In 2014 the first scientific project to study the population was started. If you are here during the winter, you may be able to arrange to spend a day on a boat with the scientists observing the whales. There are more details at Whales in Mexico. While you are out looking for flukes, you also are likely to see sea turtles, rays, dolphins and schooling fish. 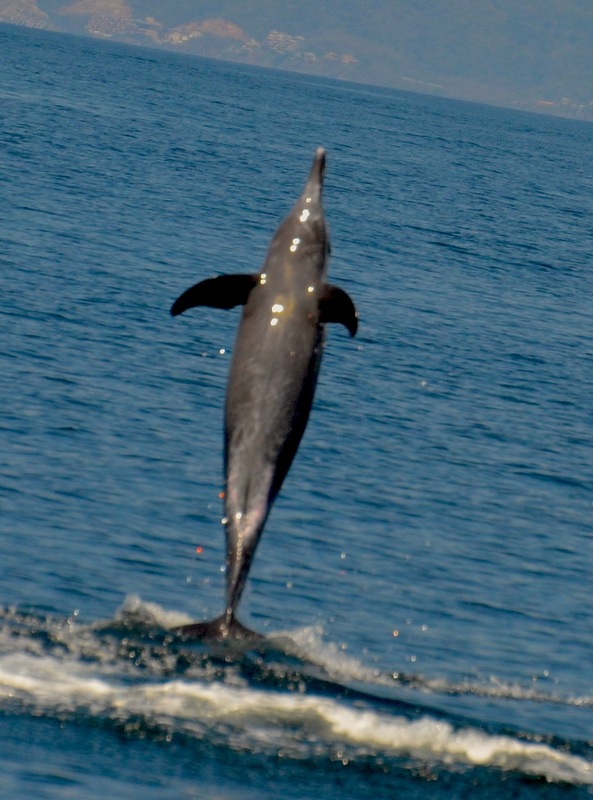 We know of four different types of dolphins in the region and there is a strong likelihood of seeing them year round if you get out on the water. The local species include spotted pan tropical dolphins, bottle nose dolphins, rough toothed dolphins and long-beaked common dolphins. We know that the area is a nursery for spotted pan tropical dolphins. Rough toothed and long-beaked are listed as ‘data deficient’ according to the IUCN since little is known about them because they are rarely seen near shore, but they come in close to Last Best Beach. 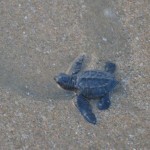 Playa Blanca beach is a major nesting area for three varieties of sea turtles. We have a turtle rescue and conservation center on the beach named Campamento Tortuguero Ayotcalli . It is located near the airport. 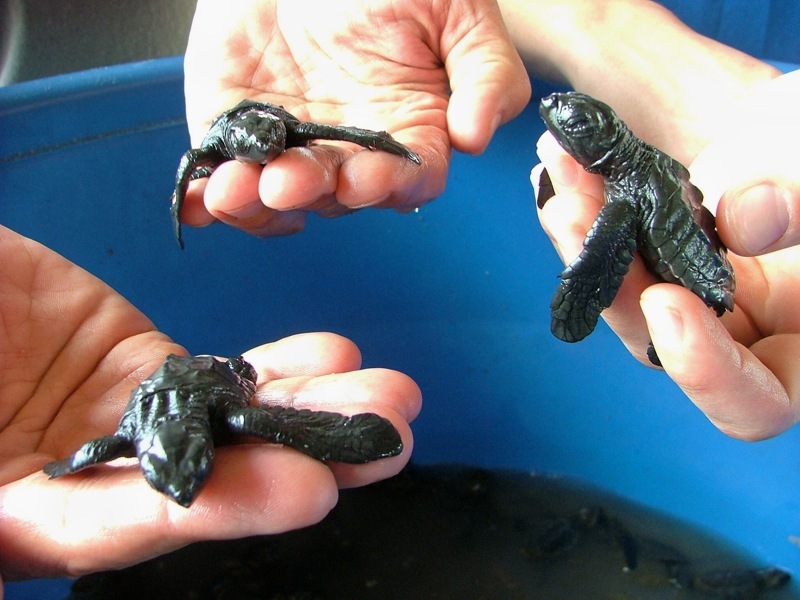 Its volunteers release over 20,000 hatchlings a year. 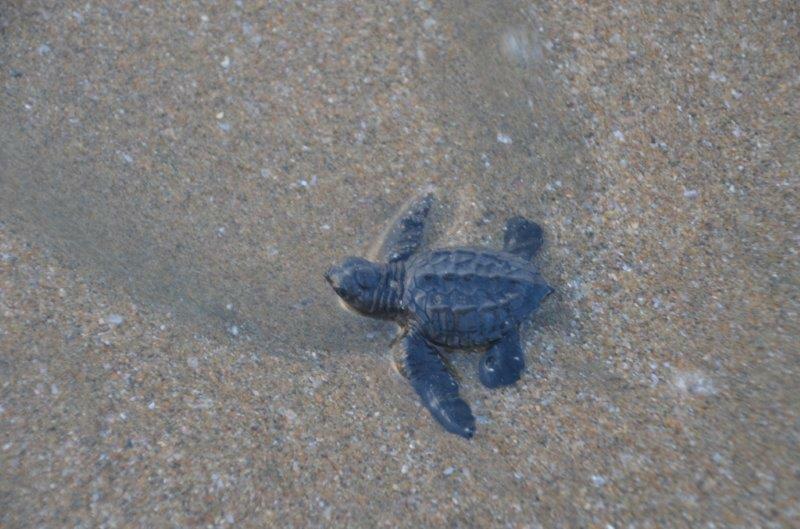 During most of the winter season, the chances are good you can participate in a release of baby turtles at sunset at the camp. The release will be proceeded by a short explanation in English. It is an extraordinary experience and highly recommended. Local taxi drivers will take you there and wait to bring you back for a flat rate. If you want to dig deeper, both figuratively and literally, you can volunteer to ride along on a late night turtle roundup. Volunteers drive the beach late at night on ATVs to find fresh turtle nests. They carefully remove the eggs and transplant them to the camp where they can be protected until they hatch. This link takes you to a simple online nature guide centered on Playa Blanca. It will give you an introduction to the birds, fish, butterflies and plants you likely will see on a visit. This is a partial list of local guides who provide boat tours in the area. Almost all the tours start and end near the mouth of the lagoon near the enramadas. 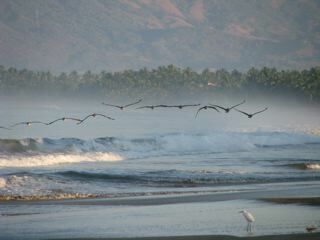 Typically they go in the laguna to see birds or go out towards Los Morros (the White Rocks) for birds and various sea life. From around December until March, they also can go looking for ballenas/whales. There is more wildlife and generally less wind chop in the mornings. The easiest way to connect with your guide is to ask the name of the panga/boat and look for it. The cost of tours generally depends on the number of people, the length of time and the amount of gas burned. A 10% tip would be very appreciated. 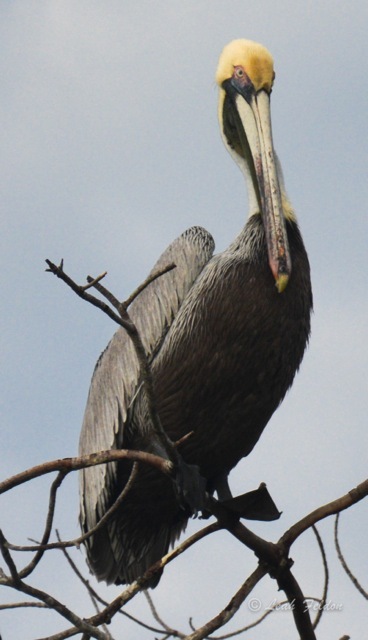 Araceli specializes in bird tours in the lagoon from small paddle boats. Her English is very good. The cost is 200 pesos per person, two people minimum. The tour runs about two hours and provides an intimate look at the lovely Laguna Potosi. Contact her at Enramada Rosita along the back edge of the lagoon road or call 755-130-6829 or email her at ecotourchelioregon@gmail,com.